RS Components offers the availability of a new programmable version of the well-known 4000 series of environmentally sealed circular connectors from Bulgin. Rated to satisfy different levels of prevention against dust and water ingress, including the IP66, IP67, IP68 and IP69K standards, the 4000 series of miniature connectors targets use in a broad range of data monitoring applications located in harsh external environments. Typical applications comprise deployment in agricultural monitoring systems to improve farming processes and efficiency; use of remotely operated vehicles in the subsea sector for the oil and gas industry; use with automatic number-plate recognition cameras for road safety and national security strategies across Europe; or to connect up pumps, lights, cables and control modules in fountains and other water-based public displays for special events and exhibitions, for example. The 4000 series now provides versions with smart programmability via the use of an embedded memory in the form of an integrated EEPROM chip. These programmable interconnection solutions can be connected to a central station in a remote data-monitoring application, for instance, and allow the reading of information, particularly concerning a connected sensor. 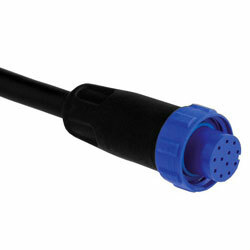 While the smart connector has not been produced to read actual data output from the sensor, it allows engineers or technicians to promptly identify issues such as an incorrect connection to a sensor. The series provides compact and versatile 19.1mm-diameter circular connectors with a robust construction made from UL94V0-rated flame-retardant materials, together with a quick-turn bayonet coupling mechanism, which allows a secure connection with the requirement for specialist tools. Achieving high performance, the environmentally sealed connectors are also excellent for applications where space is at a premium. The series can carry a mixture of voltages and currents and combines 4, 6 and 8-pole devices with 5A, 125V ratings or 10 and 12-pole units with 1A, 50V ratings.